Do you have a favorite pumpkin memory? 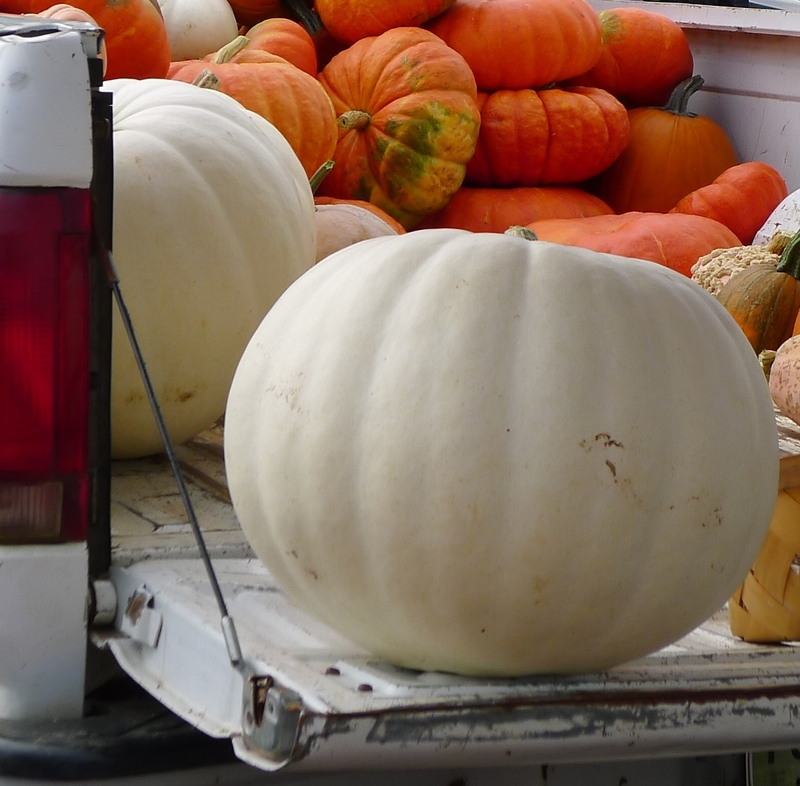 Mine is of going to the pumpkin farm with my grandparents – climbing into their old station wagon (they used it for everything from hauling groceries to pungent, raw fleece), and driving along winding roads with names like Old Stage, Bacon Branch, and Hot Shot Ramsey. Granddaddy sang songs from his WWII army days, and Granny and I joined in. Granny only shushed him a few times. 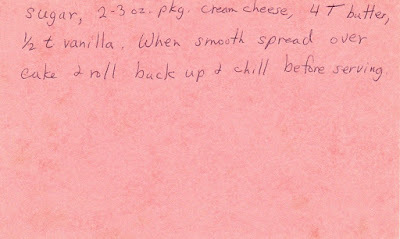 We’d follow the Little Buck River and stop at one of the farms that spread along its broad banks. 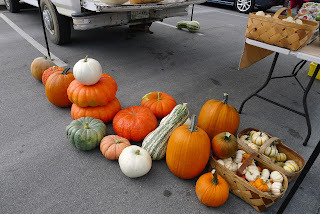 There were acres of pumpkins, and I had a terrible, wonderful time choosing the perfect one. While Granddaddy helped me, Granny looked over the cooking pumpkins. 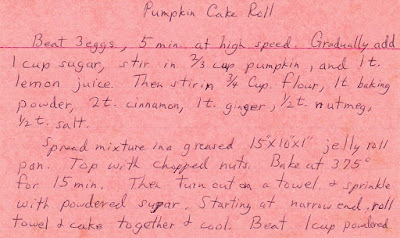 The whole way back to Blue Plum, I was sure I already smelled the cinnamon and ginger and nutmeg in one of Granny’s pumpkin cake rolls. These days there’s a farmers’ market in Blue Plum on Saturday mornings. Last Saturday I asked Geneva if she wanted to come with me to pick out the perfect pumpkin for the front porch of the Weaver’s Cat. She said I’d caught her at a bad time, though. Joellyn Cobb was teaching a needle felting class and she wanted to keep an eye on the women with their barbed needles just in case. “In case of what?” I asked. “Well we won’t know unless I stay, will we,” she said. She might have been a little cranky. All morning customers had been coming in and exclaiming over the gorgeous weather and saying things like, “It’s the kind of day that just makes you glad you’re alive.” The problem with that nice sentiment, of course, is that Geneva isn’t. She’s a ghost, and sometimes she takes that kind of hard. So I went to the farmers’ market in the parking lot behind the courthouse by myself. And even though Geneva stayed behind in the shop, the ghosts of pumpkin hunts past came with me. 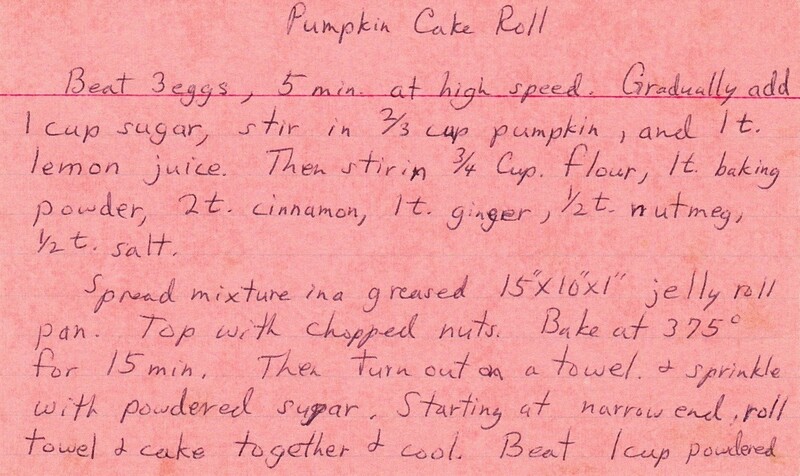 I whistled one of Granddaddy’s songs as I searched for the right carving pumpkin, and as I picked out a couple of baking pumpkins I swear I smelled cinnamon, ginger, and nutmeg. 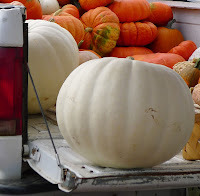 What are your favorite pumpkin memories? Have you ever carved a white “ghost” pumpkin? 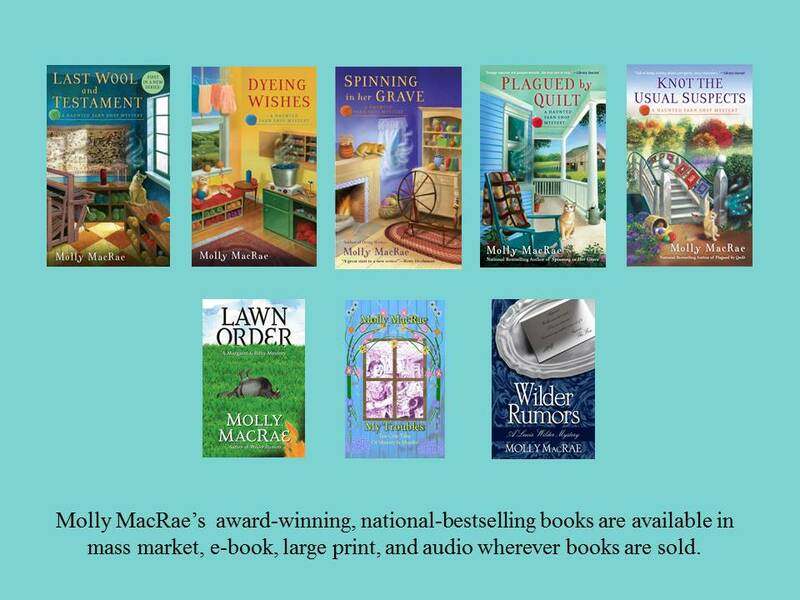 Visit Molly MacRae on Facebook, Twitter (@MysteryMacRae), or Pinterest, or find her the first Monday of each month at Amy Alessio’s Vintage Cookbooks and Crafts. I agree, Sheila! And saving the seeds to roast and eat later. Good memories! I can't look at a pumpkin without smiling. You and me both, Willow. Thanks for stopping by! Pumpkin seeds are the best! Last year my mom had some really huge pumpkins that she grew in her garden and then had them by the deck for decoration. After it got really cold in November I cut the pumpkins up to get the seeds. She saved some for growing this year. She shared with her neighbor, too. Mom's didn't grow huge pumpkins from the seeds but her neighbor's did. That seems rather strange. It was always fun, when the kids were young, to have them carve the pumpkins. Good memories! I have not carved a "ghost" pumpkin. I can't believe Genevieve didn't insist on going with you to pick out your pumpkins. She's funny like that, Elaine. 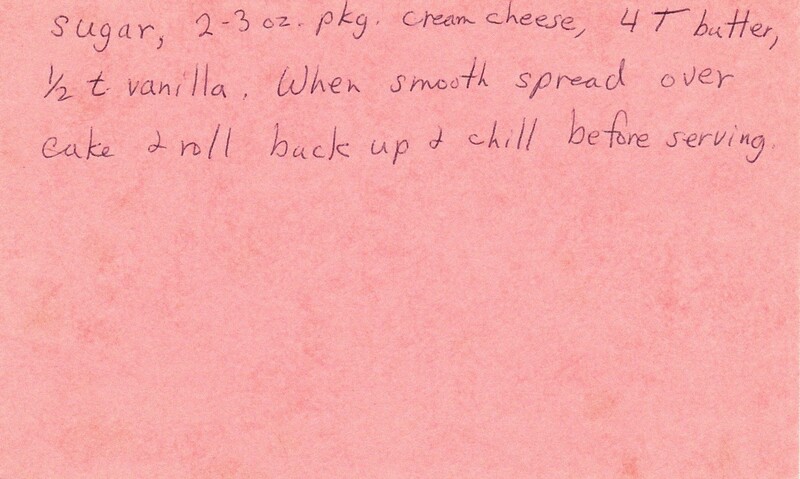 I'll make one of Granny's pumpkin cake rolls, though, and the ginger in it should make Geneva happy. Thanks for stopping by today!